"You are doing what over the holidays? Are you nuts?" "Nah... we are going to take it easy. We don't want to rush things. We hope to take our time and all will be fabulous! Plus, we don't have any plans to host, so really, it's no big deal...."
So the hole may have been a bit pre-mature and ambitious. But there are no words for the excitement I felt taking that first swing and kicking off a project we have been talking about for years! After the kitchen renovation initiation happened, the fam was hit with a horrible head cold and stomach bug; one after another we dropped into puddles on the couch. That was almost an entire week set-back I didn't plan for. Then, I realized that I was the last blogger in all the land without a Christmas tree or any decor. So last weekend once we were all finally feeling better, we took our annual trip to the tree farm to select our tree and spent the day spreading holiday cheer. The following day was spent emptying out and packing up every last cabinet in the kitchen. So now I have boxes of kitchen stuff everywhere, bins of Christmas stuff everywhere, a tree in the garage and only a few weeks in and I finally "get it". Add in the desire to get some new products released in my shop before January, I may have bit off more than I can chew. Why do I do that?! Darn over-achiever wanna be. My husband always says, "Multi-taskers are only doing multiple things halfway right." He may be on to something. Anyway, I am trying to get some furniture re-arranged today so we can focus on decorating for Christmas (nothing big this year, but still something special for the kiddos). However, I thought I would take a break to sit down and share our plans for the kitchen renovation ahead. 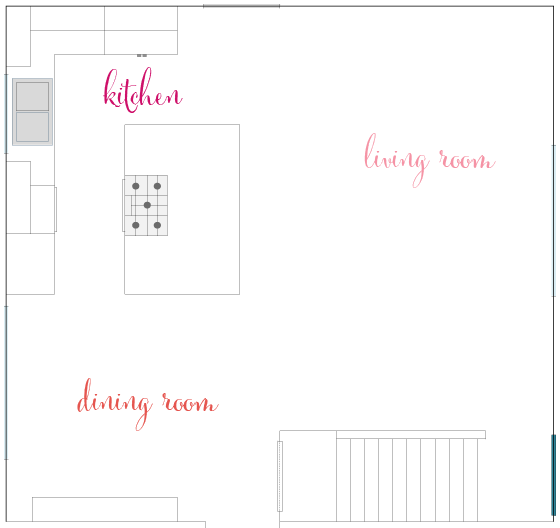 One of the 2,954,653 reasons I heart this blog, is because I was able to go back and re-read my first kitchen planning post from almost two years ago now. 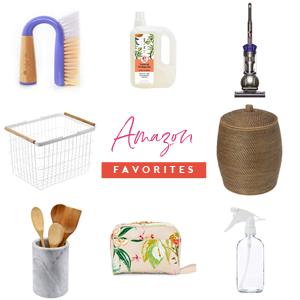 The post outlined our wishlist items, and what I love most is that we still have many of the same ideas on that big wishlist today. Knowing this is not an investment we want to mess up or regret, I am happy that we are going into this with a confident plan and sense of where we want to end up. And as much as I would have loved to put a hole in the wall two years ago, I am glad we have been letting the anticipation build and that we have allowed our hearts settle on something we agree on. Plus, it feels great to have the majority of the house in order before starting something so big, so that is a win as well! Aside from the fact that our cabinets are not a color we love and our counters are about 13 years old but 20 years dated, the biggest reason behind the renovation is to open things up! There is this crazy tall wall between our kitchen and our living room, and it has really become such a burden in day to day life. With three growing boys and two large dogs, our kitchen area always feels cluttered, closed in and overwhelming. If we have guests over for parties, there is a division between our living room and kitchen/dining area, so everyone congregates in one space or the other, but rarely both. With the wall up - each space is approximately 11 1/2" feet wide. Working with long and narrow rooms has posed some layout challenges as well. Pretty amazing difference right? I think so! The biggest concern was losing the storage on the wall we are removing. Here are a few ways we will ensure we are not losing any storage, in fact, we plan to gain with this update! We wrote down everything we currently store in each cabinet and drawer in our kitchen, and came up with a new plan for each category. The new cabinets will be taller and make the most of our ceiling height. Right now the cabinets are standard height, and we plan on installing cabinets that are 39" tall. By removing the peninsula that currently jets out into our kitchen, we can relocate our dishwasher near our sink and extend the storage on the long wall. A floor to ceiling pantry cabinet will be installed, and items will be easier to access in comparison to our current pantry situation. The cabinets we are installing in the kitchen corner will make better use of the given space. Although the island has not been designed, we are hoping to add in special storage solutions for our baking dishes and spices. Where our beautiful hutch once lived, we will install six feet of lower and upper cabinets, as well as a serving counter for hosting dinners and parties. 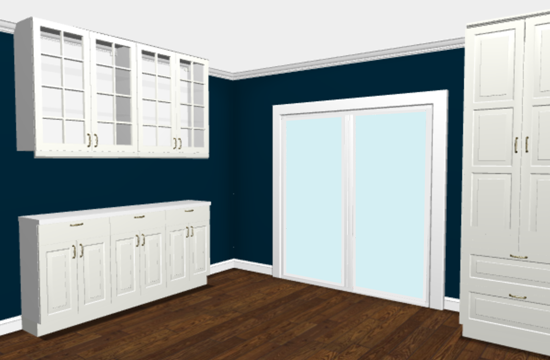 Although I still haven't 100% landed on colors and finishes for every last item in the space, I do know that I would like white cabinets for the outer perimeter of the kitchen. I am sure some of you are hanging your heads in disappointment, but I need to select something that I can live with for many, many more years to come. I can't do colorful cabinets to be trendy or different, only to dislike them three years from now. 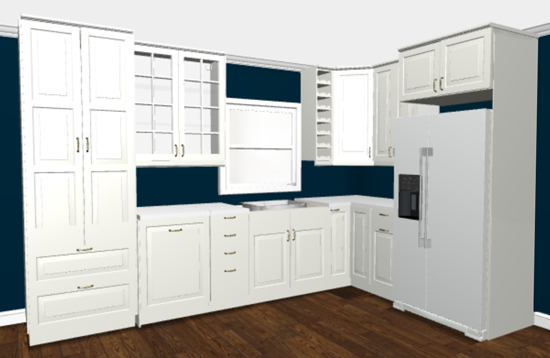 That doesn't mean that there won't be color and that everything will be predictable, but the main cabinets, white. In fact, the cabinets have already been purchased and majority of them are sitting in boxes in our garage. Based on reviews, feedback and the great 20% off sale, we opted to do an IKEA kitchen for the main cabinets. Hello, soft close happiness! However, we really want our island to be a piece of pretty furniture with maximum storage potential, so we plan to do something more custom with that. The process of purchasing the cabinets was a bit of a headache. As much as we love IKEA, the experience was typical. Although we had already gone in weeks earlier and created a plan, the day we went in to finalize things and purchase the cabinets, ended up taking over five hours! First, one of the items was newly discounted, so we no longer hit the 20% off discount threshold. Once we found an alternative solution and were finally set to go, at the last minute we were told that our dishwasher to go with the cover panel had been discontinued and there was no possible way to purchase it any longer. Back under the threshold we went, and we had to revisit our plans once more. Of course, I know that all of this was a blessing in disguise because in the end, we ended up with a better design and added in some things we didn't think of round 1 (or round 2), but in the moment it was a tiring process. 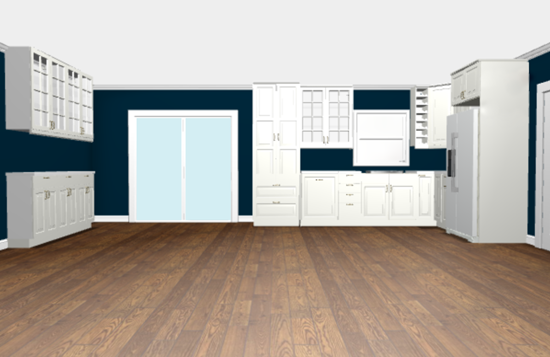 Again, the colors are not decided, my walls most likely will not be navy, but here is the IKEA kitchen plan in all of its glory. As I mentioned, there will also be an island filling in that empty space, however, because we did not purchase it from IKEA, it is not shown above. I opted against any open shelving, and selected a few cabinets with glass doors instead. As much as I love the look, I just can't imagine the dust that must accumulate over time. We haven't landed on backsplash, hardware or fixtures, but the image above gives a pretty good idea of the layout and the design. That pull out cabinet next to the fridge? That is for our garbage and recycling. Little things like that make my organizing heart race. Other items I am most excited about are the framed in fridge (which will not have the large gap as shown) and the tall pantry! We also plan on adding our own crown moulding to customize things a bit more. In the dining room, more glass cabinets above and concealed cabinets and drawers below. We have a few ideas up our sleeves for customizing the kitchen to feel less IKEA and more us, but I think we have a bit of time ahead of us before that can happen. As we emptied our kitchen, we selected key items to keep out and boxed up the rest to store away during the renovation. I also purged about 6 boxes worth of items that will either be donated or placed in a garage sale in the spring. I joked with my husband that I must be really good at organizing, because I could not believe how much we were storing in such a limited amount of space. But more on the packing process in a future post. It wasn't as quick as I thought it would be, but hopefully we have a good plan in place to protect our sanity over the next few months. I know that there are probably many more items you are wondering about, so feel free to ask below. I will also be sharing plenty more posts in regards to selecting finishes, counters, tile, hardware, lighting, etc... Along with the kitchen update, we would also love to tweak things in our living room and still play with a ceiling treatment as well. With all we are biting off on our own (we are planning on doing as much as possible ourselves while hiring out things like electrical, plumbing and hvac), we have decided not to rush the process or put stressful deadlines on anything. Although, I am not sure how long I can grin through the chaos ahead. I may need a few juggling tips from my favorite circus clown. With our building permit in hand, we hope to finish tearing out the rest of the kitchen after our home is smiling with Christmas decorations. Speaking of, I am off to make snowflakes with the boys. Any tips you have for surviving a massive renovation are welcome! Thank you my sweet pals! So exciting! It's going to open up your house so much! I have no doubt that it's going to look gorgeous! Love the plans! What do you think you'll do with your hutch that used to be in the dining room? I haven't decided. I have gone through every room in our home about ten times to find a place for it, but I may have to break down and sell it. :( It is probably one of my favorite pieces of furniture, so it won't be easy to let it go, but the amount of storage and surface we are gaining outweighed keeping it. Oh, I wish I lived close to you and could buy it! It is so beautiful! But I agree, your new storage will be so great, you hopefully won't miss it much. I'll buy it! I am only one state away! Maybe we could mix in a Reader Space while we are at it! Huge hugs Girlie! You are amazing!! LOVE! Excited for you - the kitchen is the hub/heart of the home and to have one you have dreamed of is magical! (And, totally worth the wait) Our pantry's our almost identical. Vertical, tons of storage, so happy to have a designated food pantry! But...I have lots of trouble with seeing all my food and have yet (3 years of playing with storage and organizing solutions) to find "the" wonderful metheod that doesn't have me pulling everything out every few months in frustration. I'm looking forward to seeing how you organize it because I'm super desperate to find something that works!! I am up for the challenge! :) Did you do the pull out drawers at all? They didn't offer them for the size we selected, but we are considering building our own. xoxo! We love our pullout drawers in the pantry. You don't have to squat down and rummage through boxes and containers to find something. It is easy to keep organized and to clean. Also, very user friendly for our kiddos. Can I sent you pictures of my kitchen?, Its all of IKEA, lidingo model in white, its very beautiful and my husband and I have ridden all of us (Sorry for my english from Spain). Absolutely! I would love to see it María! Oh, the kitchen plans look great, but are you getting rid of your beautiful turquoise china cabinet?! I have loved it ever since I saw you post about it! I wish you were in Michigan, I'd love to buy it from you :) To have something beautiful from you would be so EXCITING!! I wish you the best with your renovation! Oh, I wish I had some good tips to survive a big reno. Sadly, I don't. I don't know how my mother did it when we were kids. My father was forever tearing things apart or back then, you could move in without your home completely finished. So there were a few instances of moving in before they were finished. Oh yes! I just noticed the other day that Dana's layout was quite similar to ours. And I really love how her kitchen turned out, seeing it got me even more excited! Good luck on your kitchen remodel. It took us 450 days to put our kitchen from total gut job to functional. It is still no means close to being finished. It is worth all of the hassle though. I am sure your new kitchen will be AMAZING! I will make sure to remember that 450 days is OK, when we are still knee deep at that point. :) Best of luck to you as you continue creating your dream space! This is so exciting! Good luck with everything! 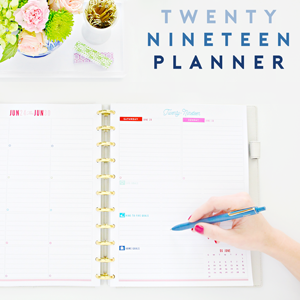 Love your plans - it's going to look gorgeous. We made the mistake of purchasing a GIGANTIC wardrobe at IKEA last Friday and getting same-day delivery. We wanted to build it and get it set up (and re-arrange our house to accommodate the new wardrobe) before our cocktail party the following evening. It took us SEVEN HOURS to build the wardrobe (let alone transferring all of our clothes over and moving our old dressers to new locations in the house!). Somehow we managed to get it all done before the party, so no regrets, but... yeah. It's so tempting to look at what we want to do and just go ahead and DO it, without thinking about how long it will take to complete! Wahoo! Congrats on getting everything done before your party! I do that quite often and always wonder why, but there is something about having a tight deadline that just gets things done. :) Fingers crossed it doesn't take us 7 hours to assemble each cabinet, lol. I might cry! We had a hot plate and a microwave set up in the basement for weeknight meals, which were canned or freezer dinners. On the weekend we would eat out, which was a treat because at the time we generally ate out once a month or less. My dad installed a freezer in the laundry room and they moved the fridge to the garage while the reno was going on - it worked out ok.
We used paper plates and plastic utensils. Super wasteful but we didn't have a dishwasher or a kitchen sink to use. My parents farmed us out to friends' houses as much as possible so we didn't get on each other's nerves too much. I don't think it really matters when you do a project like this, when it works for your family, it works for your family. Next Christmas you'll have it all done and pretty and in a few years this Christmas kitchen reno will be a small blip in your mind. Good luck and Happy Holidays! Thanks so much Sarah! 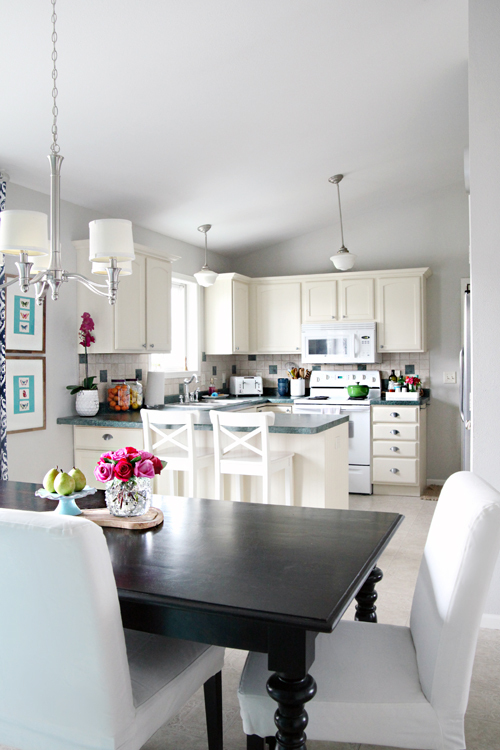 So many great tips and I am glad to hear you have positive memories of the kitchen update! Beautiful! I've survived bathroom and entryway renovations when it is -10 below butnothing in our kitchen. One question? Just because it is something I have experienced and personally wouldn't choose. Would you rather have a large island or have the very center of the island the stove? It makes large projects a little more difficult because you are always working around the stove. But at the same time it is handy to have all that work space next to the stove. One other thought, if you can at all you will not want the stove knobs in the center of the stove on the horizontal surface. My sisters knobs have melted because the canner is so much larger than the burners. Knobs on the vertical surface or off to the side would be better for me. If you are not a canner no problem. 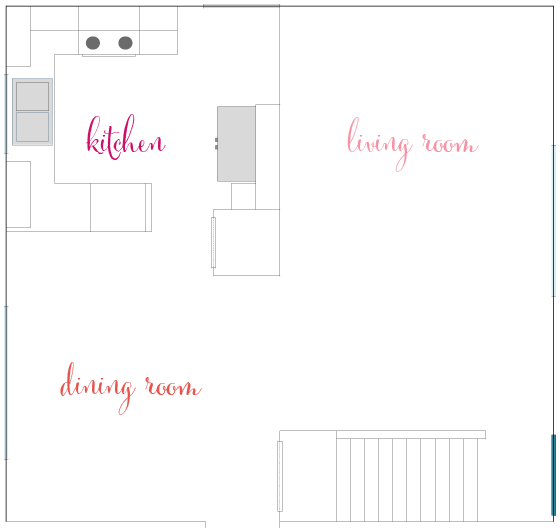 I love love love the new floor plan and am excited to watch you get your dream kitchen you have been dreaming about for years!!!! Great question! We definitely considered endless stove options, but we found ourselves really limited with the placement options for the cooktop given the size and layout of our kitchen. My in-laws have a cooktop in their island and overall are pretty happy with it and enjoy having ample surface on either side of it. We are going to try and make the island counter as deep as possible to give us even more space to work with as well. xoxo! Are you placing the stove in the island? We are planning on doing a separate cooktop / oven, however, we are also researching all of our ventilation options and haven't made any final decisions, but yes, both will go in the island. xoxo! Nothing like a month later I come back to reply. :). I know you have been mulling ideas for years and am excited to see the results! My in laws have a sink in their island. And the stove where they used to have the sink. :). But their island has a curve to it and the sink is on one end. There are so many different options for kitchen place. I just wish I could fit an island in my kitchen! I think Christmas is the perfect time for renovations. We tore out the carpet on our stairs the night before Christmas Eve a couple of years ago. It was great because it's the one time of year we slow down from school, sports and work. We got so much done! We also remodeled our kitchen. It was more of a facelift, but there were still so many choices to make. If you haven't already, check out Gardenweb's kitchen forum. Those people eat, breathe and sleep kitchens! I cannot wait to see what the reveal, the space is going to be fabulous! I LOVE taking down walls! It all looks amazing and I cannot wait to see how it turns out! But I must say...it hurts my heart a bit to hear you are planning to get rid of that hutch! It is so beautiful and unique! How exciting! I've been planning a kitchen renovation for years and we haven't even bought a house yet! ;) Have you thought about a pot rack above the island? They don't seem to be very popular these days but I LOVE them. My mom always has one. They save so much space in the cabinets and they make it so easy to put away the pots and pans. I'm so excited for you and your family. I got butterflies reading about your plans. Everything will be beautiful in the end, just keep repeating that to yourself!!! Looks so exciting so far! It is funny how similar our house layout - we have the big wall dividing our kitchen and living area too, so I can feel your frustration! It always feels like the chef is missing out on the fun if we have people over, as they are stuck in the kitchen! 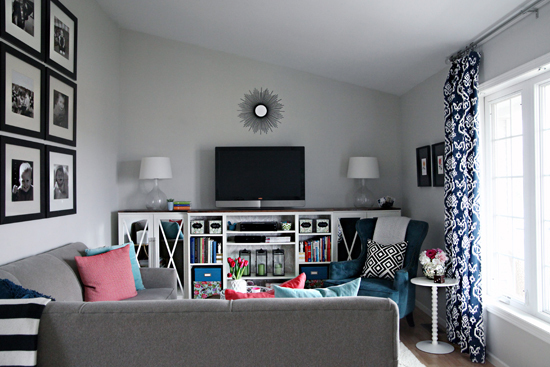 We are thinking of going with Ikea too for our kitchen reno, so I cant wait to see how yours all turns out. Good luck with it all! Our family survived a complete kitchen make over. It was tough - I'll admit! I also have three growing, hungry boys and it really helped to always have a meal plan ready to go that was realistic to the "new" mess that was created that day. Also, I packed a lot more than just our kitchen/family room. All non necessary things went into closets and off of every service as the dust traveled everywhere despite the plastic. Great tip! I couldn't believe how dusty one hole made everything! Good luck! I'm sure your kitchen will be gorgeous! When we lived through a kitchen reno, we moved our fridge to another room which was helpful. The best thing we did was find a good spot for our grill. Being able to throw something on the grill was a huge help in being able to eat relatively healthy and relatively cheaply. Be sure to keep your Crockpot out too! Another total lifesafer! Where are you putting your dishwasher? The dishwasher will be located next to the pantry, to the left of the sink, across from the stove in the island. It has a panel covering it in the image above, however, we haven't been able to find a dishwasher to use with the panel so it will most likely be exposed. We are considering IKEA cabinets for our "bar area" downstairs. We live 3 hours away from the closest IKEA. We love the look of the cabinets but are concerned about the quality of them versus getting maple or oak cabinets. How do you think they compare? How did you get them home? After reading many reviews, hearing only positives from my readers and heading to IKEA multiple times just to "test them out", I think they will hold up great for many years, the white seems quite durable yet very easy to clean. I am excited that we can install them ourselves and that they don't feel like typical "IKEA" furniture. I think the real comparison will come after we select an island and live with both types of cabinets for awhile. You will love how much more light will be in your kitchen/living space once that wall is out! Our layout is very similar to yours and it's great for entertaining. Can't wait to watch your progress. Merry Christmas! That is so exciting! It is tough to live in a construction zone. Embrace paper plates :) Crock pot cooking might also help you out since you can put the pot in any room when your stove is out of commission. One word of advice -- those pull-out spice racks are so cute, but I think they are a bad idea because a) your spices will lose flavor quicker next to a warm oven/stove and b) crouching down to read all those little labels does not sound good to me. Can't wait to see how it goes! I thought the same thing when I saw that spice rack/drawer! Yikes!!! That would be a great place to store cutting boards or cookie sheets though. I LOVE the kitchen layout and can't WAIT to see what you do with it! (colors, fixtures, counter tops, etc) I am also on Team White Cabinets, I think they are such a classic look that can be accented with more trendy, less permanent items to keep things fresh. LOVE, LOVE, LOVE it!! I wondered how spices would maintain that close to heat, however, I really love that I could also use it to store all of our oils and other cooking bottles. Maybe we will move it a drawer away from the oven... not 100% sure yet. That was my first thought about spices next to the oven - same with the oils as heating them may make them go rancid quicker. I haven's looked too closely at your layout, but wondered if perhaps a pull-out spice rack might work on upper cabinets? Thanks for sharing your plans as you go! Ahhh I am SO SO excited to follow your reno journey! I cannot wait! I love the plans! I so badly want to redo our kitchen but there is nothing really wrong with it per se, I just hate the cupboards and benches. We're pretty limited with the space we have so we don't really have the capacity to change the layout much. We're planning an Ikea kitchen with white cupboards and a wood benchtop with a mix of open shelves and closed cabinets. Sadly it's a few years off but a girl can dream!! This is going to be SO EXCITING to follow! Great plans! It's going to look fabulous! 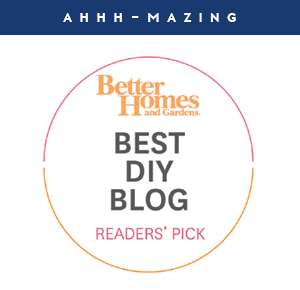 We haven't tackled our kitchen reno yet, but I posted some of my general renovation tips the other week: http://homeon129acres.wordpress.com/2014/11/26/tips-for-making-renovations-manageable/. It sounds like you have a good plan. It's so important to be clear on what you want. (And yes, open shelves do get dusty. I had them once but won't again). Awesome! I am off to check them out! Thank you Julia! We've been through nothing but major renos in our place since we moved in (4.5 years). Here's my best piece of advice. Wine. Lots of wine. Oh! be prepared before you tear it all out. Make it as simple as possible. Less trips to the hardware store for something forgotten or waiting for the order to come in is best! But hey! You're THE organizing lady. You have this handled! we bought the same cabinets you are planning some months ago - and we love them. They look wonderful and have so much storage space. Our additional colours are light grey (for one wall, the others are white), light brown tiles on the floor, and marble tiles on the walls. It looks great! And I can change the style of the kitchen by changing the colour of the accessoires quite easily. Right now, I have got red towels and napkins, in spring they will be light green and pink and in autumn maybe red and brown. Good luck for your kitchen renovation! Keep calm, stay focused and within some weeks your dream kitchen will come true. Tearing the wall down is really a great decision! With the open space, you can just move freely and accommodate more people. Can't wait to see the obviously stunning results! What do your boys think of the kitchen remodel? Are they excited or is it "just another one of mom's projects" they have to live through? I have to say, we are moving to a new house this Spring and starting completely from scratch and your blog makes me feel like I can handle it, like I can make the new house truly perfect for us, thank you. And thank you for the sweetness Chrissy, and congrats on your new home! Such an exciting time to start fresh! My family survived a kitchen reno about 13 years ago. It put my 3 yo (at the time) in the hospital. We had to open up the dropped ceiling and she ended up with bronchitis from breathing the junk in the air. Scary stuff! My best advice is to never hire anyone you know on a friendly basis because at some point you will disagree and feelings WILL get hurt. Keep it professional and business. Our reno did turn out well and I still love the layout of my kitchen. We opted for total custom wood cabinets built by a master carpenter so we got everything we wanted without having to make it fit the dimensions so every nook and cranny was used. Totally believe in drawers vs. cabinets and make sure the area over the refrigerator actually comes forward enough so you can reach it without a step stool. I store all my baking sheets and party ware there. So useful! Thank you for the tips Nadine! So sorry to hear your little one got sick during the process, but glad for a happy ending. And yes to drawers vs. cabinets! I have only heard great things about that solution! I agree about the white cabinets. Something that big, shouldn't be something really trendy, you would get tired of it in a couple of years. Our cabinets are espresso color wood and even though we did our kitchen 3 years ago, and then came the white kitchen and the gray kitchens and the mix of white with dark wood cabinets, I still love mine. They are timeless. 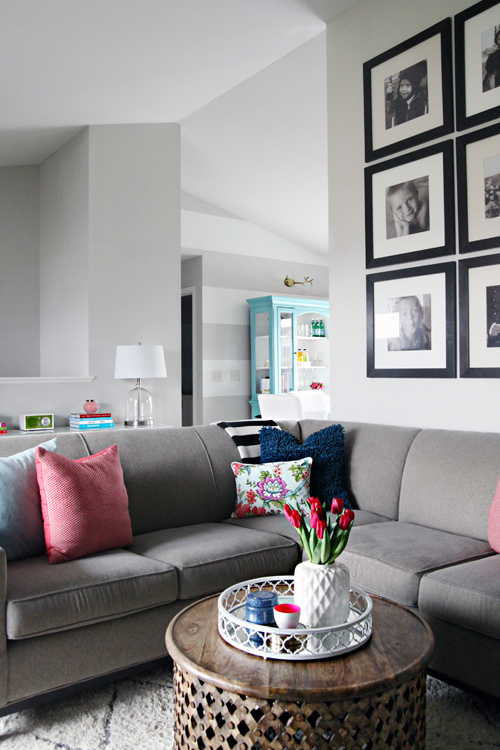 Could you use your hatch in the family room? I know it's weird but it's so pretty! There are no walls that can handle the hutch in the family room either. I may store it for awhile to see if I can make it work somewhere, but if not, I think I can bring the look of the cabinet back into the space in other ways. Hope it all goes smoothly. The corner left of the fridge looks a bit cramped. Can you move the fridge to the right at all? Also will the fridge have enough air circulation if there is no gap above it? We should end up with more usable corner counter space than we have now, and plan on making the surface of the island a bit bigger as well, so we think it will be OK. As far as the fridge, it comes with specific space requirements for installation, which will be using as a guide while piecing together the cabinets. How exciting! I didn't notice a place for the microwave...is it going to be incorporated into the island? Good luck - I'll be following along to watch your progress & be inspired! We almost opted for no microwave considering we typically only use ours to heat up a bowl of soup or reheat occasional leftovers (even those are more often done in our small toaster oven). However, we think we will just get a very small microwave and store it on a pull out shelf in our pantry and keep it concealed behind doors in-between uses. 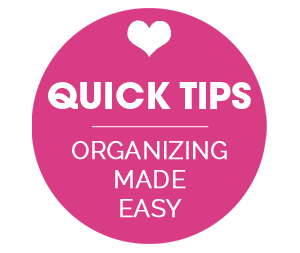 I love to organize, and this is a great blog. I love the idea of opening up the space by removing the central wall, but have to wonder if it isn't a load-bearing wall with it being in the middle of the home? Will you have to add any supports when you remove it? That is the first thing we looked at and made sure to consult directly with the original builder of our home to be sure that the wall is not load bearing. The structure is supported within the trusses. That gives me hope for a wall in our house that I'm not sure about.....maybe someday. Best of luck, I know it will be amazing!!! Wow! Such a stunning and dramatic difference! Very inspiring, thank you so much for sharing, I can't wait to show my husband! WOW WOW WOW!!!!!!! Great transformation. We have that same layout, and what you did is was so close to what I wanted to do (but not enough funds). Beautiful! 1. If possible, have your electrician install an outlet inside one of the cabinets (maybe in one near the dining room table?) This can be used to plug in chargers for your phones/electronics so it doesn't add clutter to the counter. (This is assuming you charge your phones in the kitchen). 2. I recommend under cabinet lighting. It really helps to light up the area where you are chopping, prepping, etc. 3. I am not sure if you are installing new floors -- if so, I recommend being very careful with the fridge and your floors. We have hardwood floors in the kitchen which I love, however when the fridge was installed they got a little scratched. Some people install floors last after everything is in place. My contractor did not. 4. I know someone commented above that they did not recommend the pull out spice drawer next to the oven or stove. I have it and have to tell you I love it. I have not noticed any loss of flavor of my spices, and it holds everything very neatly. 5. Is your oven going under your stovetop on the island? Just make sure you have enough room to open the door easily. I can't wait to see how it all comes together. I am a huge fan of your blog and am always so inspired by your ideas! Wonderful advice Cheryl! Thank you so much! 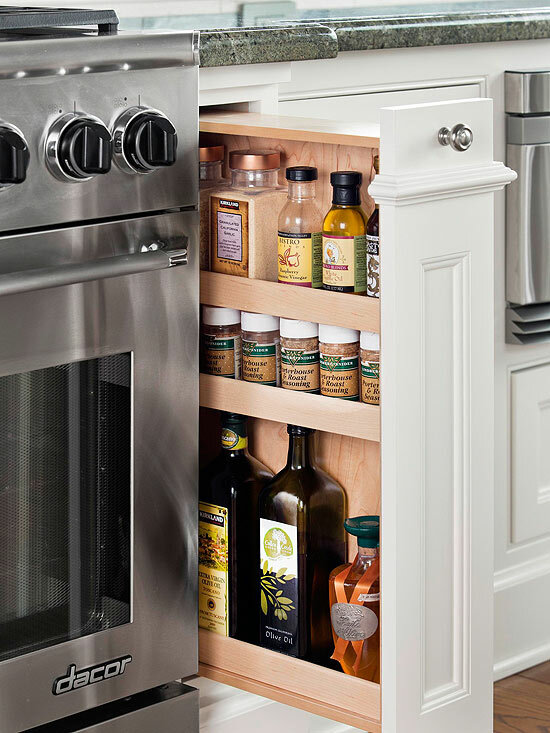 Glad to hear you like the pull out spice cabinet, it is one thing I am really looking forward to adding. Have fun! The plan looks great. As an owner of a house with a great room (kitchen, informal dining and living room are all open to each other), I definitely couldn't have it any other way. Also, one thing I really like about my kitchen island is that there is storage on both sides. The area on the left is closer to the stovetop therefore pots, pans, lids, and cooking utensils are in the drawers and cabinets on that side. The right side is where the barstools are and there's three cabinets on that side as well. They're a bit more narrow but still long so it has worked out well for my seasonal decor. I had a question about the 2015 PLANNER - I love how your planner looks and I have looked all over for the Martha Stewart Discbound Notebook in blue (its my fave color) but they seem to be discontinued. 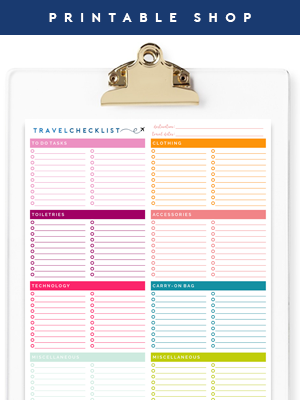 Is there a similar product you could recommend as my planners seem to tear and mess up badly when used in a regular 3 ring binder? Thanks! Have you looked into the Levenger or Staples Arc systems? Both are quite similar to the Martha Stewart Discbound options. I am also bummed to see her line dwindling. I know right! I loved the Tiffany Blue color! Thanks so much for responding! Oh my goodness!!!!! I am so excited for you! That kitchen is going to be amazing and taking down that wall will make your house feel so much bigger! When we remodeled the kitchen in our last house, I had extension cords running from our fridge to the bathroom, cooked pancakes on the griddle on the floor in our bedroom, and washed dishes in the bathroom! But it was worth all the headaches and mess in the end. It didn't even so is from buying another house that needs a total kitchen overhaul☺ Good luck and I can't wait to see updates! I love your plans and can't wait too see your beautiful kitchen come together. We are also planning a kitchen addition/remodel. We already extended our house out 8 feet, but are waiting another year or two just like you all did to save and make sure we are 100% sure what we want. I would love for you to do a post on how you're managing and staying organized through the remodel! 1. Drawers over doors! We converted several of our cabinets into deep drawers with heavy-duty hardware to accommodate the weight of dishes, etc. I'll never go back! I urge you to consider using drawers instead of doors wherever possible. 2. We also wanted to remove the wall between our kitchen and living room, but it was load-bearing, so we compromised by cutting a "window" as large as possible in the wall. Though it didn't allow for the open floor plan as we'd hoped, it still made a huge difference. 3. It's better to live with unfinished for a few days or weeks while making decisions or planning out the next phase, rather than rushing to finish and regretting it. We've had several situations when the extra thinking time allowed us to see potential problems we hadn't noticed previously and solve them before any time or money was wasted. Jen, I don't have time to read all the comments, but I do have some advice about your island. We had a kitchen island placement very similar to yours - the stove and oven were actually on the wall instead of in the island - and quite a few of our neighbors with similar layouts had a BIG problem with the placement of their island. Basically, the oven door would open and there wasn't any room to get around it - which is a problem if you need to set it down on the stovetop or the other side of the oven. They would have to stand to one side. It was really inconvenient for most of them, but dangerous for little ones - especially if they sneak around to the other side of the island. I know your kids are getting bigger (mine are about the same ages - it's so sad! And so great at the same time), but you have dogs to worry about and it might be an issue. In our old home we had about 12"-18" clearance the oven door, and it was just about right. Even though it messes up the work triangle a little, it was nice to have a little room to maneuver if there was someone cooking and someone putting dishes away and someone tidying up all at the same I time. I would even say 2' clearance might not be a bad idea. I dot know if your island will actually be a piece of moveable furniture, but maybe play with the placement of it for a couple of days before you actually install it. Congrats on getting started! We just renovated, and I echo many of the comments here. Drawers are so much better than cabinets - pot drawers, spice drawers, plate drawers, etc. Have as many drawers as possible in your lower cabinets and island. My absolute favorite part of my kitchen design is that we put the trash cabinet in the island where I do my prep. I can just slide the remnants of chopped veggies right in. Also, before you finalize anything, be sure that you know how your living room furniture will be arranged. 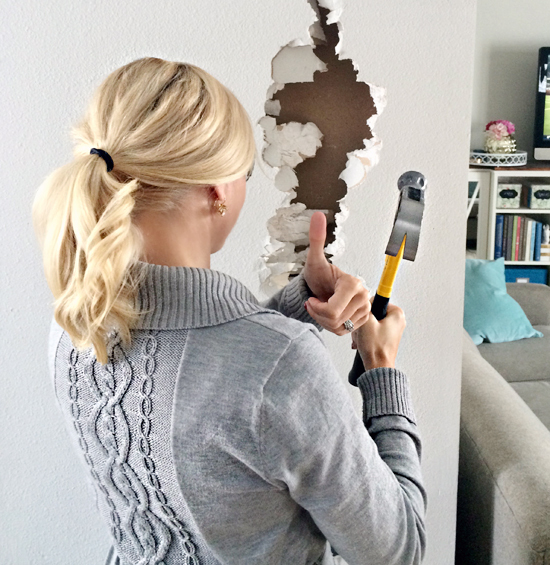 Taking down the wall can make this harder than you think, especially if you have constraints like seating facing a tv. Best of luck with everything! Wow it looks so exciting. We renovated our home at the end of last year. We also put in a new kitchen and have an island. Which I love. We put in a pull out drawer for rubbish and recycling. If I could do it again I would put this pull out in the Island as we find that this is where we work the most. It would be great to be able to wipe down the island bench straight into the rubbish. Another thing I have seen are the corner drawers. We had then in our old kitchen and were a fantastic use of space. Can't wait to see how it turns out. Make sure you have a QUIET dishwasher. Our Kitchen and living room are open and while our dishwasher is not a cheap model it is very obvious when it is on. It does make it hard to hear the tv in the living room. Just a thought. Can't wait to follow your journey! This comment is late, but I was thinking about renovations and this is what helped me the most. When we were washing dishes in the bathtub for about 4 weeks, or cooking on an emergency butane stove, or looking at a never ending mess, I kept reminding myself that we chose to renovate. And it was a luxury. And we were blessed to be able to do so. That helped me though all of it! You guys will be awesome at it! Here is the link to our before and afters if you wanted to breeze through the pictures really quick, as I know you are a busy lady! http://leeandruth.blogspot.com/2013/09/first-kitchen-remodel.html Merry Christmas! I am so happy for your Jen! I can't wait to see the finished product! This is SO exciting!! It will be so much fun to follow along. Random side question, do you happen to know where the sweater you're wearing in your hole-in-the-wall picture is from? So cute!! I'm looking forward to watching your progress on the kitchen update. We did the exact same update to our fixer-upper. I will be curious of your plans for the side door entrance, which I assume is coming in from the garage and is a main entrance for your family. We have a side entrance from our garage into the kitchen/living room with no wall to separate the space or closet to hang coats. I struggle with making an entry where there is not a defined space for it and organizing the shoe and coat clutter. Best of luck on your remodel! Amen to no open shelves re: dust. I have a hard time keeping my stainless stove with a black top dust free despite cleaning it multiple times a day. The thought of what might lurk on my white dishes on an open shelf that is cleaned less frequently gives me hives. Can't wait to see your finished kitchen. I'll live vicariously through you until I can finally do mine! what program did you use to do the current layout & new layout? I am trying to plan a few renovations to my house & that is exactly what I am looking for!